SeafarerHelp is the free 24 hour multi-lingual helpline for seafarers run by the International Seafarers' Welfare Assistance Network (ISWAN). 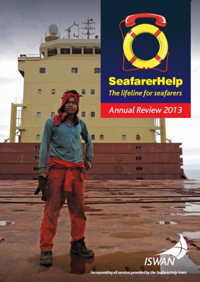 ISWAN have just produced the 2013 Annual Review for SeafarerHelp. During 2013 the SeafarerHelp team dealt with problems involving over 6,400 seafarers and their families. There was a 35% increase in the number of new cases handled by the SeafarerHelp team, and an increase of 47% in the number of seafarers assisted compared to the previous year. The most common problems seafarers faced were upaid wages, problems with repatriation, contractual problems, sub-standard conditions on board and health issues. Roger Harris, Executive Director of ISWAN said "The SeafarerHelp team did a great job in 2013 working 24 hours everyday of the year assisting seafarers. We wish to thank our funders and other supporters for helping us provide this vital lifeline for seafarers all over the world." One case where SeafarerHelp provided assistance was to the pregnant wife of a Ukrainian seafarer who contacted SeafarerHelp to complain that her husband had not been paid for over three months and that she badly needed the money to prepare for the impending birth of their child. We soon established that her husband and the rest of the crew had been abandoned in South Korea by the ship owner, and the caller's husband agreed for us to refer his case to the ITF. The local ITF inspector boarded the ship and arranged for it to be arrested by the local authorities. The ITF also arranged for the seafarers to be repatriated to their respective countries. However, the seafarers could not be paid their outstanding wages until the vessel was sold by auction. In the meantime, the seafarer was very happy to go home and saw the birth of his baby. A few months later he and all his colleagues finally received their outstanding salaries when the vessel was sold. The SeafarerHelp service relies upon charitable funding for its continued existence. If you are able to financially support SeafarerHelp, then please contact Roger Harris at iswan[at]iswan.org.uk. The Annual Review and the infographic can be downloaded from the bottom of the page.